Inside one of the classrooms. 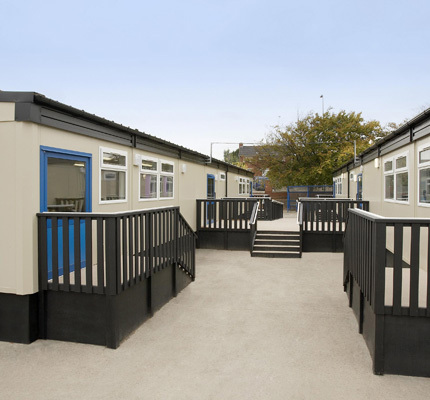 Two of the double classroom blocks on hire to Rhoose Primary School. The primary school in Rhoose, South Wales had a problem. Like many popular schools in Britain today there is the predicament of demand outstripping pupil accommodation. It stands as a testament to the achievements of the headteacher and her staff, but it was a dilemma that had to addressed, and quickly. 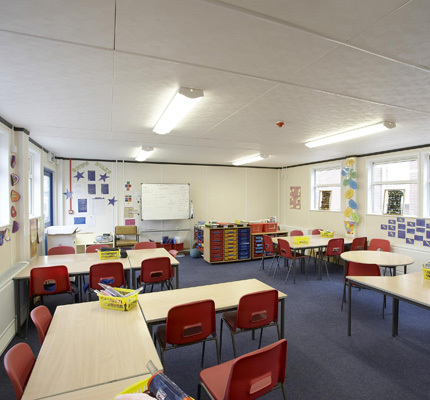 Wernick Hire came up with the solution in the form of three double-classroom blocks on hire for an initial period of approximately 18 months. The contract included foundation work, drainage, and all trenching for mains services. Steps, ramps, hand rails and decking between the six classrooms were also included in the contract, together with a large tarmac playground on an adjacent field.